When choosing a mare...TrueNicks or conformation? I think a lot of things have to be brought into consideration. 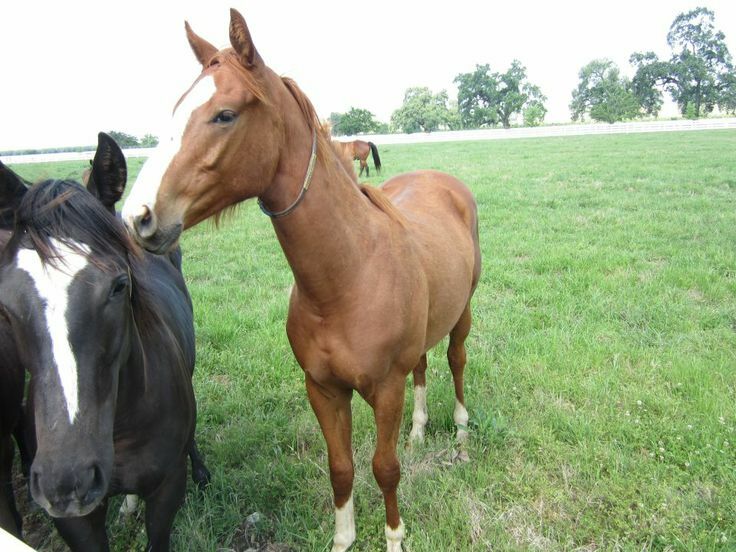 Understanding the faults of the mare and the stud - not doubling up on mutual problems. If mare is a maiden, breed to an experienced stallion with a record of producing sound get who get to the race tracks. If the breeder likes the type embodied in the mare, look for a stallion to complement that type. Surely take into consideration nicking, but not necessarily make it gospel, but it should factor into the decision. To me, soundness and health would be my top priority. I'd be wary of a lot stallions rushed off to the breeding shed before they could finish their 3 year old year. I've never bred a horse. My experience which is a great deal comes from 40 years of breeding dogs. These are the lessons I've learned over the years. I can't see where it would be any different in breeding horses. My mantra has always been, first make them sound; then make them pretty. I know pretty doesn't count in making a good race horse, so lets say - first make them sound; then make them runners. There was an informal photo of Chrome standing square in the shedrow head on and it definitely showed him as nearly knock-kneed. I was quite surprised when I saw it, it was posted from sometime around his retirement on this here forum. I do like Colerful Bride's overall confo, I'm just not a fan of her topline (Sea Mona's was better, I just wish we'd gotten clearer confo shots of her entire body). The sleepy eyes really is of no concern to me, that's just aesthetic. Looking at all of these mare's dams, the production records are similar though I think Sixtyfivenorth's dam Lady Heroine has the edge due to a larger sample size and having produced a multiple stakes winner. CB is in between and Sea Mona's is similar but slightly smaller sample. I'm too tired to look past that but it could give you more things to pour over and study. You should go with your gut, when it comes down to it, once you've got all the other information on hand. FWIW a friend who is in the Chrome fan group asked my opinion and I loved Sea Mona's pedigree as a fan, plus her gentle temper--Storm Cat 3x3 and Seattle Slew 3x4, and from the Man o' War male line. Fanwise, that did it for me! Treve wrote: There was an informal photo of Chrome standing square in the shed row head on and it definitely showed him as nearly knock-kneed. Here is a knock-kneed horse (not a Thoroughbred). 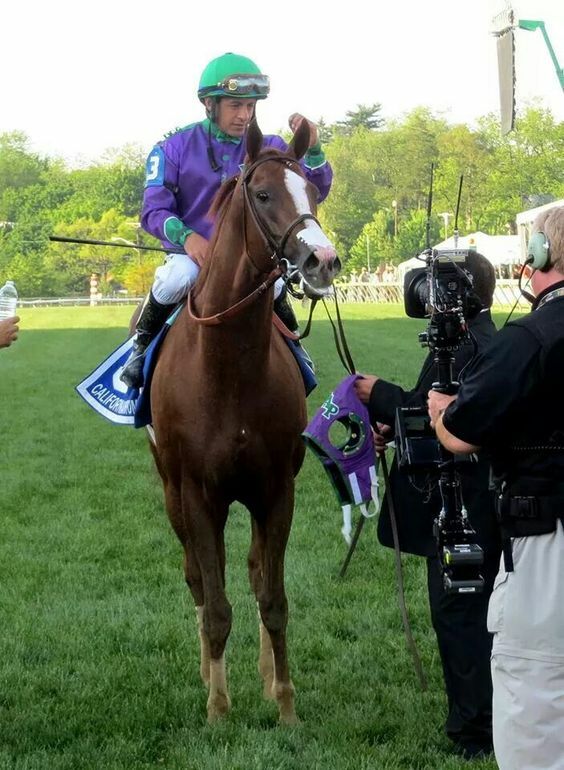 Here is the 3-year-old Chrome after he won the Hollywood Derby. 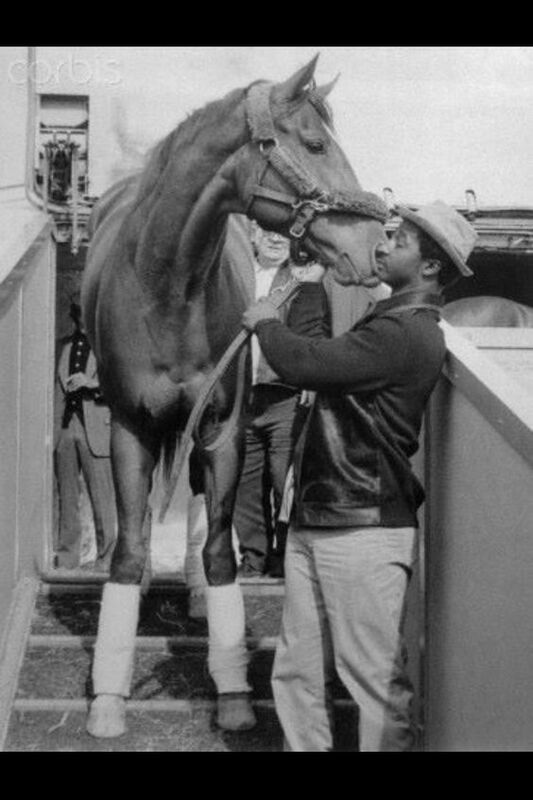 As a final point of comparison, here is a photo of Secretariat and his groom, Eddie Sweat. Red had about the straightest front legs you'd ever want in a horse, and yet just the way he's standing at that moment, one might say he looks "nearly" knock-kneed. Photos never tell the whole story. They merely freeze a small fraction of a second. And furthermore... I did say I personally would prioritize bloodlines over conformation in my first response to this thread if the foal was being bred to race, rather than commercially - I expressed the very notion that good horses, even great horses have overcome conformational and biomechanical flaws which is why I do not think it is the end of the world. And it is easier to improve on conformation than to improve a bad family or questionable bloodlines. Much harder. But if conformation is the end goal, then in my opinion when you've got a horse like Chrome that is mostly well conformed wouldn't you want to maximize your chances by avoiding a mare with a similar issue? He could improve a mare on virtually any other aspect, it seems odd to pick a mare that has the one lone similar flaw if you're breeding for confo. Neither of those photos depict a horse standing square, or on even ground but that photo post hollywood derby does show a little bit what I'm thinking of. His front left especially, and googling pictures of him yields that same odd angle with his front left over and over again, including pictures of him as a foal and a yearling. 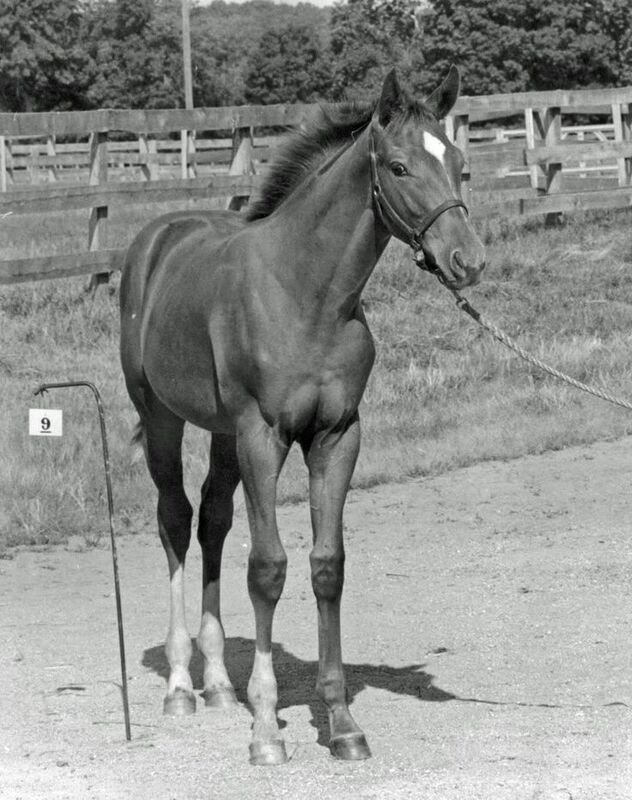 For comparison here is Secretariat as a weanling (notice that while Secretariat could give the slight impression of toeing out, his knees don't angle in or seem tied together). And neither of the photos you posted would be held against either horse. But it is interesting to me that the photo you posted the first time happens to be one where his front left is in movement and you therefore cannot see it. Regarding the video, there isn't a single shot of him standing square where his legs are visible, and while I was the first to point out during his 3yo campaign that he had an incredible stride, towards the end of the video when they show him trotting in slow motion, he has a bit of... I'm not sure what it is called in English in French we say "le cheval billarde" likely due to his knees. And that photo you showed as an example of knock-kneed is exactly the kind of angulation I was thinking of in that Chrome photo that I'm thinking of. My initial reaction when I saw it was something along the lines of "holy sh*t, no wonder he twisted his knee in the Pegasus, it's a testament to the horse that it hasn't happened more often". I'm not knocking Chrome, Ridan, he's a beautiful horse with wonderful conformation overall, he was talented and I wish him much success in the shed. ETA: I found the discussion and the photo I was thinking of. I did not see Chrome in person so I can't attest to Retrospectiv's comments, and I don't recall the video Izvestia is talking about... but I knew I wasn't the only one who had noticed. In all the conversations I've heard about California Chrome this is the first time I've heard anyone argue vehemently about how correct he is. @TBird, I have not been "arguing" that Chrome is correct. Only that he is not as badly conformed in front as some have claimed. This is why I posted multiple pics to provide points of comparision, and vids to enable people to see for themselves rather than take anyone's word. Agreed with others. Chrome is built like Daffy Duck. He's crooked from his knees down. Always has been. Take it for good or bad, it's just how he is. Knocking other horses won't change that fact. Retrospectiv wrote: Agreed with others. Chrome is built like Daffy Duck. He's crooked from his knees down. Always has been. What an unfortunate comment. (1) Are you unable to do a compare and contrast exercise? That's all the above is. Doesn't knock any horse. Not Chrome, not anyone. (2) Daffy Duck? Overly harsh much? I'd love to have such an "ugly" duckling as Chrome. $14,752,650 won, 2 time horse of the year, 7 grade 1s, wins on all surfaces, 27 Starts, 16 Wins, 4 Place, 1 Show. I'm not going to argue the point with you. You've already made up your mind on him. I hope he throws some correct foals from the mares chosen. I'm not offended, no worries. You asked about truenicks vs confo, I gave my initial opinion which is "truenicks to be taken with a grain of salt", and that I'd place confo above truenicks, but I'd place bloodlines over confo. And commercially confo over bloodlines. However you can't really create a rule of thumb for something that has so many variables which is why I added the caveat with regards to conformation; i.e. it's not just a question of whether or not a mare has good confo, but rather how does her confo complement the sire's confo... I might pick a mare that has slightly less good confo overall if the stallion's best qualities compensate for her flaws, than I would a mare that has better confo overall but whose flaws aren't as well compensated by the stallion. The goal of breeding is always to improve on the curent generation. In this case Chrome's confo is relevant if one is making a choice between mares that he's been bred to, based on conformation. I've stated time and time again that he's handsome and he's got a lot of qualities. His front angles aren't part of those, in my opinion, and if I were to choose a mare bred to him, I'd choose a mare with straight front legs to compensate, and wouldn't worry about a lot of other aspects cause he has several qualities that would improve on a less well conformed mare. I don't know why TM uses that photo though it really doesn't do him justice, especially compared to the other stallions. I also hear a lot of foals have corrective surgery for leg defects. Are stallions required to disclose whether they had surgery for such corrections? Thanks for anyone who can tell me. It's rare to see a perfect stallion. So most breeders are looking either for faults they can live with, or faults that don't double up on what their mares might have that needs correcting. Looking at a horse, you often can't tell what has caused the crookedness--for the most part either genetic or race related. In my experience, crookedness problems that occur in the womb usually straighten with time. The vast majority of foals are born with some degree of crookedness--that's a lot of leg to squish into a small space--which goes away as they mature. There's no requirement for anyone to disclose anything. But a stallion manager will often disclose prior surgery when asked--if he knows. By the time a stallion gets to a stud farm, he will likely have passed through several sets of hands and information like that gets lost along the way. Fwiw, corrective surgery isn't nearly as popular as it used to be. 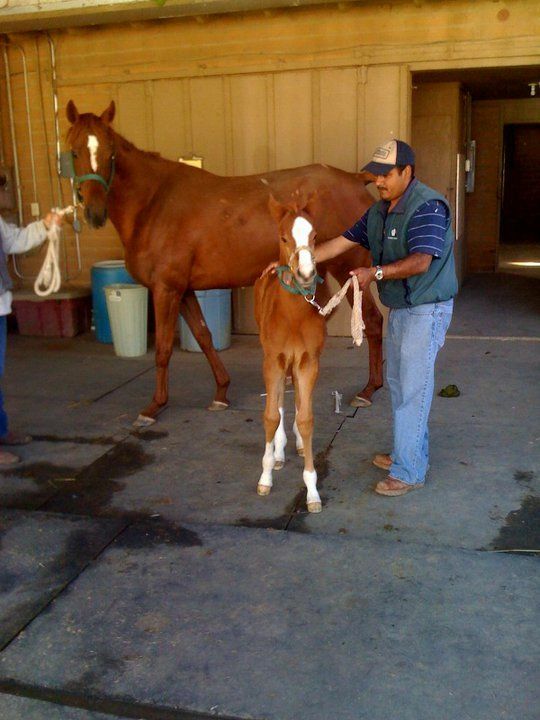 Many breeders now feel that what is corrected when a foal is young would have fixed itself naturally, given time. TBird: By the time a stallion gets to a stud farm, he will likely have passed through several sets of hands and information like that gets lost along the way. One more reason why it would be good to have a set of nationwide rules to insure that a horse's medical records - from foal to breeding farm to pasture ornament - travels with the horse through his/her life. BaroqueAgain1 wrote: TBird: By the time a stallion gets to a stud farm, he will likely have passed through several sets of hands and information like that gets lost along the way. I'm curious, are you talking about all horses or just racehorses? I can imagine very few horse owners who would be in favor. Not because they're trying to hide anything but because it would be a bookkeeping nightmare. In any given year, depending on how many states we race in, we are dealing with 7-10 vets, sometimes more. What would be the mechanism for passing the records along? Who would vouch for their accuracy? (Trainer? Owner? Multiple vets?) Most of our vet records are for small stuff: vaccines, bute, banamine, etc, but those pages add up. Not to mention that vet records (bills) come with prices on them. I doubt many vets would like the idea that horse owners would soon be able to compare costs between their own vet and every previous vet their horse had ever seen. What we really need is nationwide, consistent medication rules. But without a national governing body, that won't be happening any time soon either. TBird wrote: It's rare to see a perfect stallion. So most breeders are looking either for faults they can live with, or faults that don't double up on what their mares might have that needs correcting. Looking at a horse, you often can't tell what has caused the crookedness--for the most part either genetic or race related. In my experience, crookedness problems that occur in the womb usually straighten with time. The vast majority of foals are born with some degree of crookedness--that's a lot of leg to squish into a small space--which goes away as they mature. I had heard that it wasn't as common any more. It's a nice trend, surprising in light of how the sales emphasize perfect conformation etc. Anyway, in your own opinion/experience-would you describe any current kentucky stallions as having "perfect" or maybe "almost perfect" conformation? It would be nice if we had a national governing body. Re: requiring disclosure: The European Horse passport idea seems like a good one-recording owners, major health issues, and so forth. Doesn't/wouldn't cover drugs, but like you say, a uniform drug policy would make most of that largely redundant. Honor Code wrote: I had heard that it wasn't as common any more. It's a nice trend, surprising in light of how the sales emphasize perfect conformation etc. Anyway, in your own opinion/experience-would you describe any current kentucky stallions as having "perfect" or maybe "almost perfect" conformation? The most "perfect" stallion I've ever seen is Bernardini. For me, he just has everything you would want in a gorgeous, correct horse. But as far as racehorses are concerned, great conformation is a side issue. It means nothing if a horse has no talent or heart. And of course, with stallions the most important thing is whether or not they have the ability to pass along their good qualities. Correct conformation often means that a horse moves with efficiency. It gives him a better chance of staying sound. But it doesn't provide speed--or help a horse win races. Aside from the disciplines where horses are only shown on the line, no one breeds to a stallion because he has good conformation. They chose a horse that excels in whatever they want their prospective foal to be able to do. I realized this has been thoroughly hashed out, but, I thought I would throw in my two cents. I breed commercially, and I pay little or no attention to true nicks. For me, conformation is key, because, that's what the buyers are looking for. I don't have the money to buy it all, so I get as much pedigree as possible, without losing conformation. Ive been breeding for 10-12 years now, and this year my 3 yearlings and 1 weanling averaged $103,000, with moderate to low stud fees. The mare you talked about with the C+ true nicks would definitely be the most appealing to me for several reasons. She has the best conformation, she's pregnant to a first year horse (always the safest when breeding commercially on a budget) and she has a Tiznow in the pipeline. Those are all huge pluses when breeding to sell. Breeding to race is a whole different beast. I wish it was not, but, that's the way it is if you have limited funds. When the market gets off a horse, they're off, even if it's a consistent race horse sire, like Afleet Alex, or Midshipman.